Lt. Edward WOODMAN (1606 – 1694) was one of the 91 original grantees who settled Newbury, Mass. He was Alex’s 10th Great Grandfather; one of 2,048 in this generation of the Miller line. He was also Alex’s 10th Great Grandfather; one of 2,048 in this generation of the Shaw line. These lines didn’t come together for 350 years when I was born. 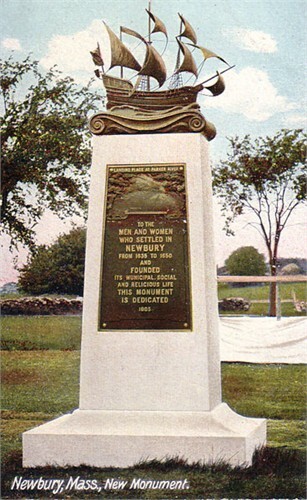 Monument to Edward Woodman, at the Burying Ground of the First Settlers of Newbury Massachusetts, located on High Street Rd/ Route 1A in Newbury and was established in 1635. Edward Woodman was baptized 27 Dec 1606 in Corsham, Wiltshire, England. His parents were Edward WOODMAN and Collet MALLET. He married Joanna SALWAY about 1628. He and his half-brother, Archelaus Woodman, sailed Southampton aboard the “James” in Apr 1635 and arrived in Newbury 2 Jun 1635 or he came on the “Abigail” a few weeks later. 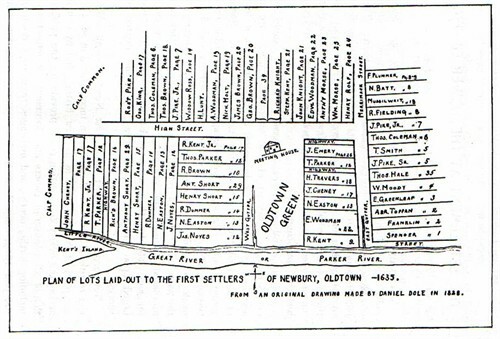 Both brothers were settled at the Newbury plantation by 1635. Both brothers lived in Newbury on Woodman Lane, now Kent Street. Archelaus died without issue. Dates for Edward’s death vary, 3 Jul 1692 or 14 Oct 1702 all agreee in Newbury, Mass. Both Edward and Joanna are likely buried in the cemetery opposite the old Coffin mansion. A monument to Edward Woodman stands in the First Settlers Burying Ground in Newbury, Mass. Joanna Salway was born about 1614 in England. Her parents were Arthur SALWAY and Mary [__?__]. Joanna died about 1688. Edward was a lieutenant in the Pequot war of June 1637. Later, he was a wealthy and prominent man. Edward had two sisters, Mary and Elizabeth. After his mother died 5 July 1611, his father married Edith (surname unknown) and had six more children: Archelaus, Rebecca, Walter, Jonathan, Anne, and David. In Coffin’s History of Newbury, Edward Woodman is called “a man of talents, influence, firmness, and decision.” The title “Mister” usually preceded his name, which implies he was a prominent citizen. Edward Woodman, a mercer and wine merchant, was licensed 12 Jan 1637/38 to sell wine and strong drink. He is also listed as “husbandman” in some records. He became a Freeman 25 May 1636 and was active in the affairs of the Congregational Church in Newbury. On 8 Sep 1636, he was chosen deputy from Newbury to the General Court, which was located at Boston, a distance of 40 miles. The records of theMassachusetts Bay Colony, in the office of the Secretary of State atBoston, show that Edward Woodman was Deputy from Newbury in 1636, 1637, 1639, 1643, 1659, 1660, 1664, and 1670. April 1637 – One hundred and sixty men, under the command of captain Stoughton, were raised to go against the Pequods. Of this number Newbury raised eight, Ipswich seventeen, Salem eighteen, Lynn sixteen, and Boston twenty-six. It will serve to give the reader some idea of the all-pervading influence of the theological discussions, which were then agitating the whole community, 1o inform him, on the authority of Neal, that, these very troops deemed it necessary to halt on their march to Connecticut, in order to decide the question, whether they were under a covenant of grace or a covenant of works, deeming it improper to advance till that momentous question was settled. These soldiers were to have twenty shillings per month, lieutenants 4, and captains 6. In May Mr. John Spencer was discharged from being captain. This was probably owing to his religious tenets, he being an adherent of Mrs. Hutchinson. ‘ Mr. Edward WOODMAN was chosen lieutenant, and Mr. John Woodbridge, surveyor of the armes at Newbury. Edward’s brother Archelaus Woodman married first Elizabeth (surname unknown) and second Dorothy Chapman. He had two daughters, but no male heirs. So all area descendants, with the Woodman surname, are from the Edward Woodman line. Newbury records show Archelaus, a lieutenant, served as representative in 1674 and 1675. 17 May 1637 – Archelaus Admitted Freeman. Archelaus Woodman, we learn from the historian, Coffin, took great interest in Governor Winthrop’s campaign for the governorship against Sir Harry Vane, as the close of the latter’s term drew near. So Mr. Woodman, with nine others including John CHENEY, Thomas COLEMAN, Henry Sewall Jr, Nicholas Noyes [Cheney’s future father-in-law], Robert Pike [future founder of Nantucket, liberal dissenter, witch trial critic and son-in-law of Joseph MOYCE], Thomas Smith, James BROWNE, Nicholas Holt [future son-in-law of Humphrey BRADSTREET, and John Bartlett, .walked forty miles from Newbury to Cambridge on foot to take the “freeman’s oath” and qualify themselves to vote in the election which was soon to take place. It was by such prompt movements that Winthrop was elected and the conservative party triumphed. Vane lost his position to the elder John Winthrop in the 1637 election. The contentious election was marked by a sharp disagreement over the treatment of John Wheelwright, a supporter of Anne Hutchinson [daughter of our ancestor Francis MARBURY (1555–1611) (wikipedia)] Winthrop won in part because the location of the vote was moved to Cambridge, reducing the power of Vane’s Boston support. In the aftermath of the election Anne Hutchinson was put on trial, and eventually banished from the colony. Many of her followers seriously considered leaving after the election. At the urging of Roger Williams, some of these people, including Hutchinson, founded the settlement of Portsmouth on Aquidneck Island in the Narragansett Bay (later named Rhode Island and joined to Providence to form the Colony of Rhode Island and Providence Plantations). Vane decided to return to England, apparently with the notion that he would acquire a royal governorship to trump the colonial administration. Before his departure, he published A Brief Answer to a Certain Declaration, a response to Winthrop’s defense of the Act of Exclusion; this act was passed after the election to restrict the immigration of people with views not conforming to the colony’s religious orthodoxy. Edward Woodman first appears in New England history as a settler in Newbury, Massachusetts, at the incorporation of that town in 1635, and from the fact that he went there in company with Archelaus Woodman it is supposed that they were brothers. One chronicler of the family history says that Archelaus Woodman came from Christian Malford, Wiltshire, England, that he took passage in the “James” of London in April, 1635, but it does not appear whether Edward came with him or arrived in New England in the “Abigail” a few weeks later. All that we know is that Archelaus and Edward Woodman sat down in the plantation at Newbury in 1635. Edward Woodman was one of ninety-one grantees of Newbury and one of the fifteen persons among the proprietors who were addressed “Mr.,” a title indicating social position, influence and character above that of the average colonist. He became prominently identified with affairs of the church and figured as leader of the movement which resulted in setting aside some strict regulations of church government. 29 Nov 1652 – At the Newbury town meeting, the town voted “that Mr. Woodman, Richard Kent, Jr., Lieutenant Pike and Nicholas Noyes should be a committee for managing the business of the schoole.”. A Baptist Church was formed in Newbury with the consent of the First Baptist Church of Boston on February 6, 1681/82. the church was formed by eight residents of the town, which included Mr. Edward Woodman and wife. In the genealogy”The Woodmans of Buxton, Maine” Cyrus Woodman wrote: “This was in his old age, and was evidently an arrangement under which he and his wife were to have a home with, and be provided for, by their son Jonathan during their lives.” The date of Edward’s death is unknown but it is thought to be after 1690. There was not record of a will being filed or proved. Edward’s s body was interred 1st Burying Ground in Newbury, Essex Co., Massachusetts. 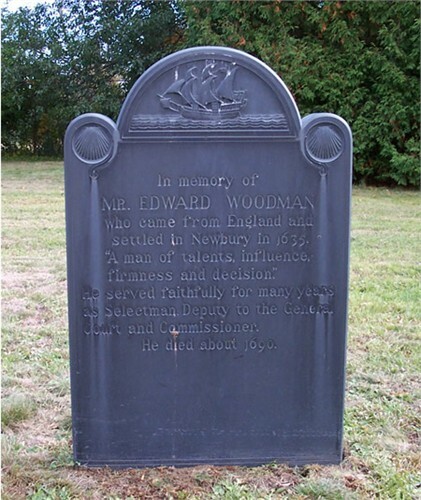 His marker reads, “In memory of Mr. Edward Woodman who came from England and Settled in Newbury in 1635. ‘A man of talents, influence, firmness and decision.’ He served faithfully for many years as Selectman, Deputy to the General Court and Commissioner. Edward died previous to 1694 and both he and his wife Joanna were living in 1687. Edward’s wife Mary Goodrich was born 8 Jan 1633 in Bury St Edmunds, Suffolk, England. Her parents were William Goodrich and Margaret Butterfield. Mary died 18 May 1684 in Newbury, Essex, Mass. William Goodrich settled in Watertown, Mass. in 1636, and died before May, 1645. John’s first wife Mary Field was born 1631 in Dover, Strafford, New Hampshire. Her parents were Darby Field and Agnes Roberts. Mary died 6 Jul 1698 in Dover, Strafford, New Hampshire. Joshua’s wife Elizabeth Stevens was born 4 FEB 1642 in Andover, Essex, Mass. Her parents were John Stevens (1605 – 1662) and Elizabeth Parker (1613 – 1694). Elizabeth died 30 May 1703 – Newbury, Essex, Mass. Jonathan’s wife Hannah Hilton was born 12 Feb 1649 Newbury, Mass. Her parents were William HILTON Jr. and Sarah GREENLEAF. Hannah died 15 Nov 1706 in Newbury, Mass. This entry was posted in 12th Generation, Double Ancestors, Historical Monument, Historical Site, Immigrant - England, Line - Shaw, Pioneer, Public Office, Tavern Keeper, Veteran and tagged Newbury Pioneer, Parker - Woodman War, The James 1635, Walked 40 Miles for Winthrop. Bookmark the permalink. I am Maryjane Woodman Thibodeau 12 th generation of Edward woodman line. Loving the Interesting history. I am Duane Arthur Woodman. My Uncle Gordon Woodman started researching the Woodman line many years ago. One thing I do remember distinctly is the Woodman Crest. That crest has taken me farther back in the Woodman history, all the way back to the 12 Tribes of Israel. A few years ago it was suggested that I was Hebrew and the Family of Woodman came from the tribe of Naphtali. I am researching and creating a new website which has not posted as of 4/2017. The older one is at http://www.DuaneWoodman.com If anyone has information about the Woodmans past let me know. I am Beryl R. Woodman II and I have been studying the Woodman past and the family crest. I am the ninth generation of Edward Woodman and fourteenth generation of Nicholas Richard Woodman. I have gotten stuck going back at John Richard Woodman born 1490. I can not find anymore information. I have also not been able to find out my legal right to use the family crest. I was in England at Hyde on a job for my company at the time 1996. I contacted the College of Arms to find out about the coat of arms and received a letter stating that there was a “Visitation of Surrey carried out in 1623(College of Arms Ms: C2/249b) . A pedigree was photocopyed and on record but there was no right to arms recorded. There was record later of three families 1668 with right to the arms. 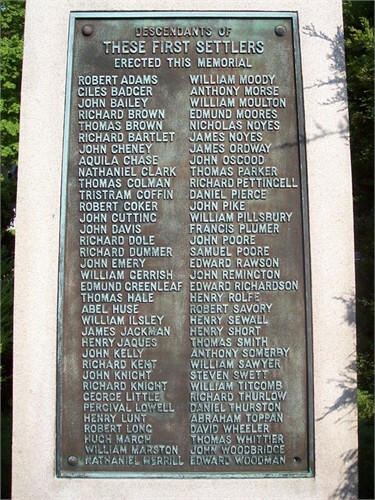 Just want to point out that Joshua Woodman, my 8th great-grandfather, was the first white male born in Newbury. Mary Brown, daughter of Thomas Brown was the first white child born there. I am direct male descendant of Lt. Edward Woodman through his son Edward Woodman. That line moved to New Hampshire, to Maine, to Quebec Canada, to Michigan. That is where 4 generations of us were when I was born 12 May 1944. Thanks again for your comments.